If blind reviews are activated, the list of authors, as input on the submission form, will not be shown to reviewers. It will remain visible to the submitters and administrators. Allow reviewers to view the list of submissions and indicate which submissions they would or would not want to review or whether they have a conflict of interest. As an option, you can allow them to view other reviewers' biddings. 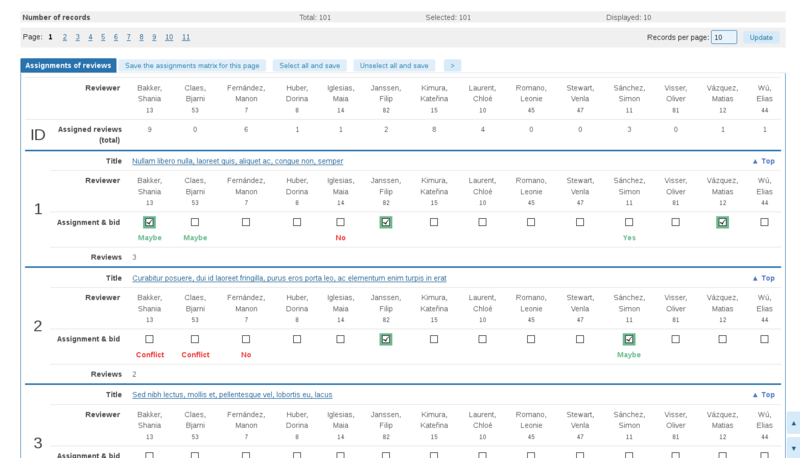 This will allow you to restrict the assignments to the area of expertise of each reviewer. Allow reviewers to view extended abstracts or full papers uploaded by the submitters. Allow reviewers to upload files containing suggestions and corrections that can be later shown to the submitters. If some of the submissions, for instance submissions by invited speakers, are automatically accepted, they can be left out of the review process. If, for some reason, some submissions are declined before the review process, they can be left out too. Exclude incomplete submissions from the bidding process and the review process. This option is useful if the submission requires the upload of a file, since a failed upload might result in an incomplete entry. Starting from a default, standard review form, customize it to your needs, by adding or removing questions / fields. Define up to 9 numerical criteria and define a range of values for the ratings. Apply weightings to the various ratings. Collect comments and feedback for the submitters. Collect recommendations for the selection process. Let the software assign the reviews while taking into account biddings, conflicts and the areas of expertise of the reviewers. Set the number of reviewers that should be assigned to each submission. Assign the reviews manually, on a case by case basis. You will be able to take biddings, areas of expertise of the reviewers and conflicts of interests into account. Set the time period during which reviewers can access their assignments. This can be made to coincide with your deadlines and take your time zone into account. 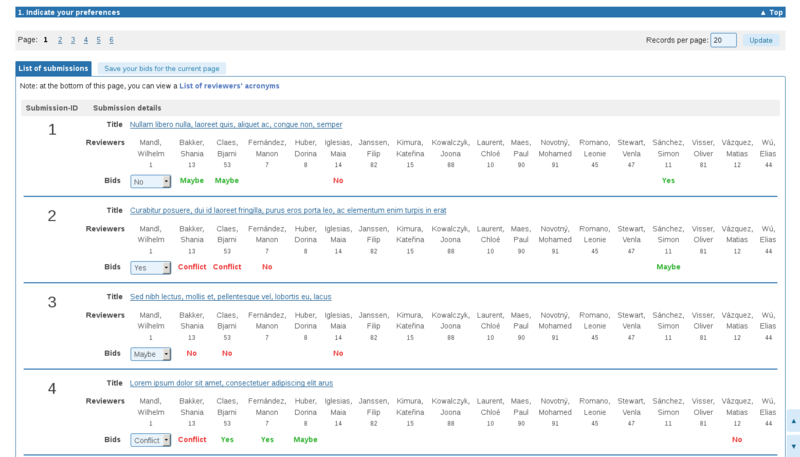 Control the data that reviewers can access (e.g. whether they can see all submissions; whether they can view the listed authors; whether they can view others' reviews). Reviewers access their assignments on a dedicated page. 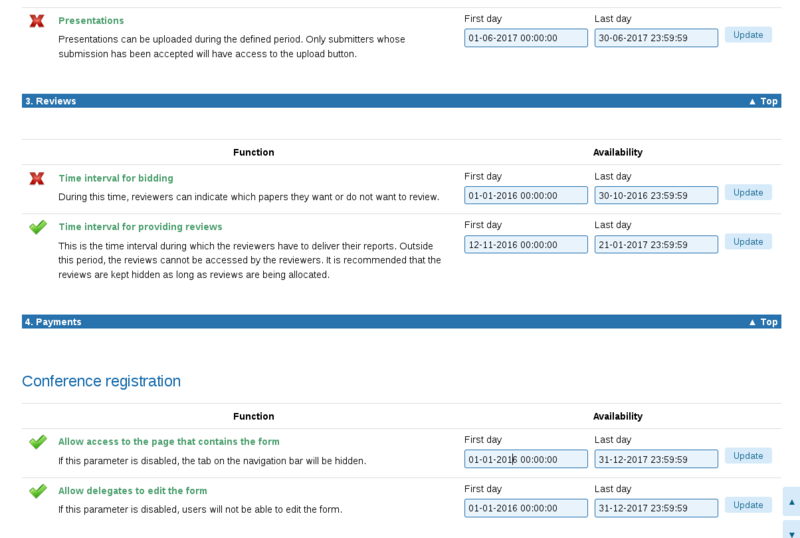 They can view and filter an overview list with key details and the status of each review. 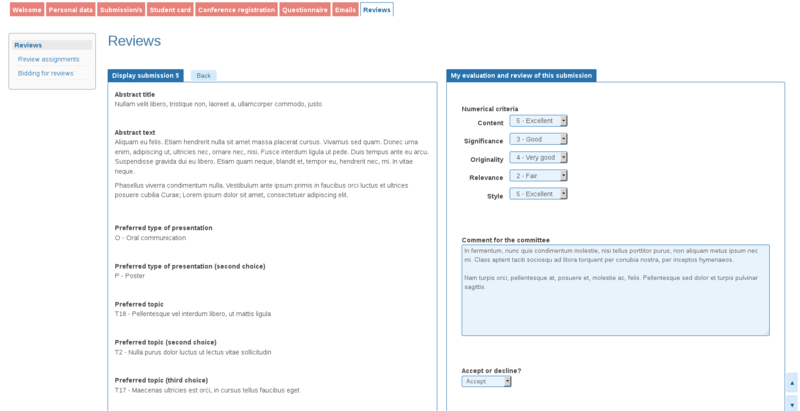 When editing a review, they will see the submission on the left hand side of the screen and the review form on the right hand side. 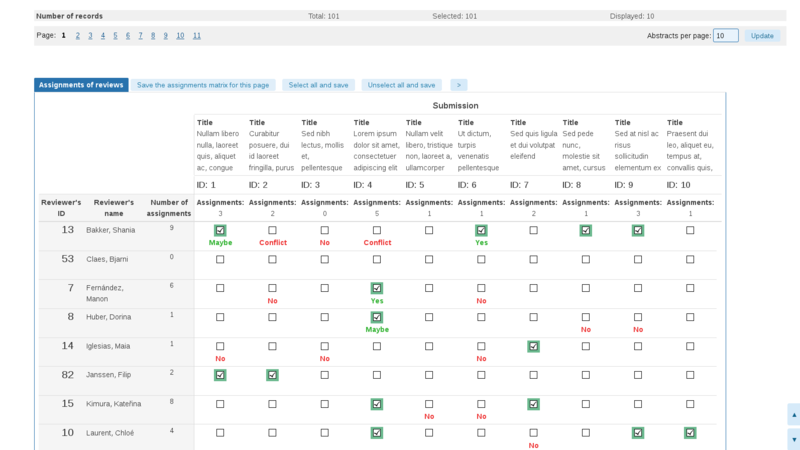 Administrators can view the number of assignments for each reviewer and the overall status of their reviews, which are shown as the number completed, in progress or not started. 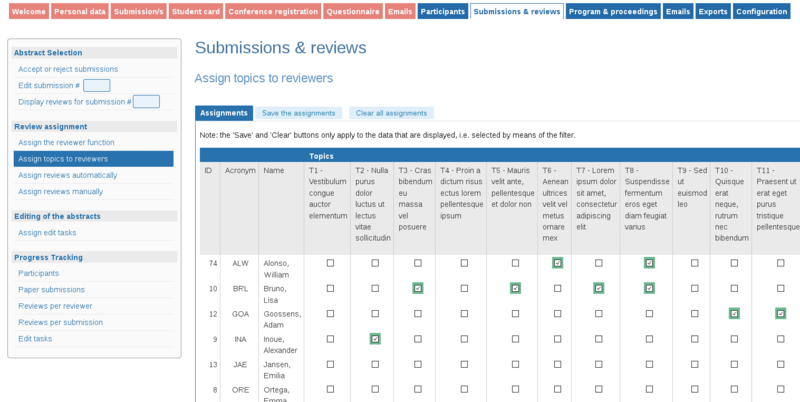 Administrators can view the list of reviewers assigned to each submission and view the status of the review for each reviewer. Send emails to reviewers to invite them to start their reviews. Send reminders. Optionally, send notification emails to reviewers as soon as a review is assigned to them. Emails can also be sent when reviews are unassigned. View the history of all the emails that have been sent out. 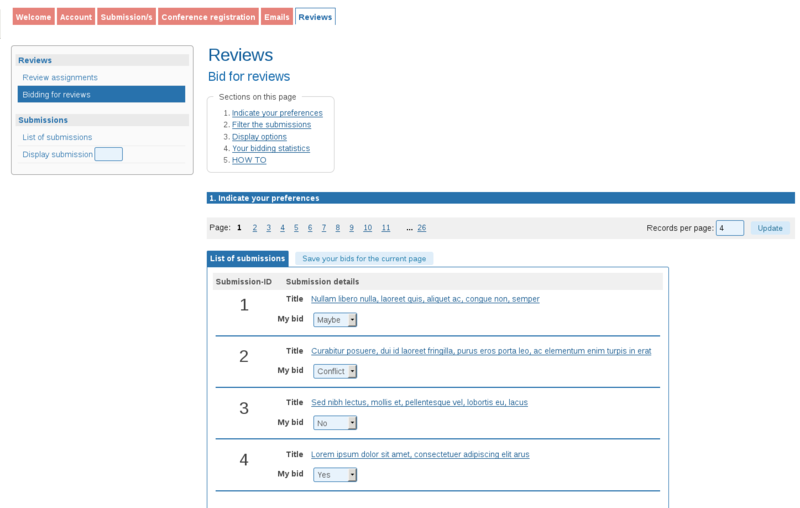 Administrators can view all the details of the reviews, including average scores, on the page used to select submissions. Administrators can export the reviews to Excel or CSV, to work outside of the system. The exports contain averages per criterion and reviewer for all criteria, as well as a global average of the criteria for each submission.